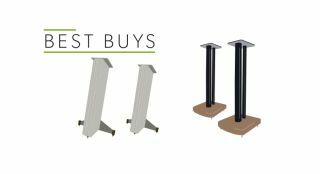 Best speaker stands 2018 | What Hi-Fi? ...and the technology is such that a fine pair of stands from a few years ago will be a fine pair of stands today. A pair of small (or small-ish) speakers designed to sit on stands will, sure enough, perform to their maximum when mounted on a proper pair of speaker stands. Here are the best for every budget. If you're looking for a bargain, look no further. The venerable Z2s help give your speakers far more detail, attack and openness, and all for less than a ton. Despite their modest price, the Atacamas work well with all sorts of speakers, from penny-pinching to pricey. These stands will allow your speakers to deliver all their weight and dynamism. They're designed to work with Q Acoustics' Concept 20 speakers, but will play nice with others too. The clever construction and elegant design will get the best from whatever you pair them with.